It's Instant Ancestor Saturday! Look at this little baby beauty? Isn't she precious all propped up with pillows and lace? I love the white gowns babies would wear. My friend Stacey from Flotsam & Jetsam has a great idea for Instant Ancestors in her business--she attaches jewelry to them, and customers get the gift of the photo with the jewelry purchase! So cute & clever! Thanks for sharing, Stacey! Here is going to be my next furniture project: This O So Loverly chair we inherited from hubby's grandma. 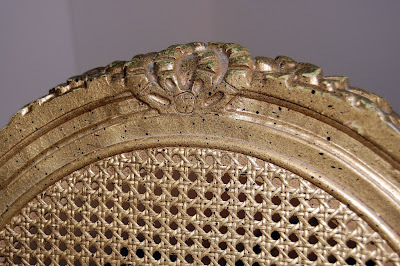 I have no idea what decade this chair is from, but behold the loverly gold with black flecks! It does have some pretty details to it though that would look great when painted a more up-to-date color! 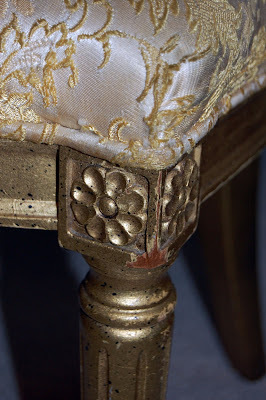 I love the caning on the back of the chair, and the details on the legs as well! This should be a fun one to re-do! 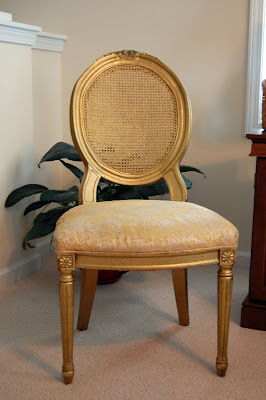 Tell me what YOU would do with a chair like this, and then see if it matches my ideas for it later! Have a Blessed Saturday, I'm off to make a late breakfast of homemade waffles for our guests!! Today I'm continuing the series on Creating A Welcoming Home, and focusing (probably because it's on my mind!) on Welcoming Overnight Guests! There are several easy and inexpensive ideas that you can do yourself to ensure that when guests stay at your home you create a welcoming & pleasant place to visit! First, your guests need a comfortable place to sleep! Whether you have a separate guest room, your guests may be using another family member's room, or they'll be sleeping on the pullout couch, make sure the "bed" is as comfortable as possible. Best way to check it out? Spend a night there yourself! You'll discover if that mattress eventually needs replacing, a room is drafty, or if the sofabed could use another layer of padding to feel more comfy. You'll also be able to see firsthand what other needs your guests might have--a lamp to read by at night, a table to place glasses and glass of water on, etc. Check it out beforehand, and you'll have happier guests! Place freshly laundered sheets, a variety of pillows (fluffy, firmer, non-allergenic), and coverlet on the bed. Place an extra blanket or cover folded at the foot of the bed in case your guests get a little chilly. A little fan in the corner of the room in case your guests get warm. Take time to make it a clean, beautiful place to stay! Add some tissues and a single flower on the bedside table. An alarm clock that lights up with the touch of a button at night is great. Put a few recent magazines or a book or two that might be of interest to your guest in the room as well. A little carafe or tiny bottle of water on the nightstand (and maybe a little chocolate if you're feeling fancy!) may be greatly appreciated. 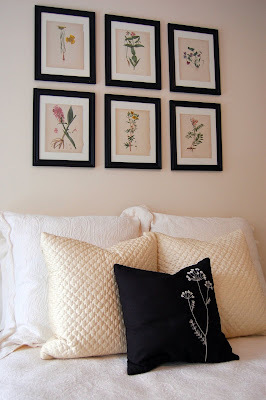 A cute touch is a framed picture of you with your guest! They'll feel so special!! Clear a little space for your guests' personal things. They would appreciate a few drawers or a bit of closet space to call their own for the visit. Put a ring dish or pretty tray or platter on the dresser to catch jewelry or little personals. In the bathroom leave extra-fluffy towels, a clean, soft robe and a basket of extra toiletries. I have a basket filled with soaps, shampoo & conditioner, shower caps, plastic wrapped toothbrushes, disposable razors, lotions, q-tips, toothpaste, etc. These are all things I've gotten from hotel travels or buying razors in bulk, or the 5 extra toothbrushes the dentist gives, then supplimented with the travel/mini section from Target! Believe me, this basket gets a LOT of use--guests usually always forget something! :) Another tip is to place a little nightlight in the hallway and one in the bathroom in case guests need to make a "trip" during the night! Make mealtimes simple and enjoyable. Be sure to ask if there are any food allergies or special preferences. Simple meals are the best. They are obviously easy to prepare, and will leave more time for enjoying your company. For breakfast, try a breakfast casserole prepared the night before. Yogurt & berries with a nice slice of banana bread is another easy but oh-so-yummy light breakfast! Dinners like lasagna can be prepared ahead of time, frozen, then baked when company comes. Easy-peasy! My dad likes Diet Coke--a LOT!! :) I am sure to have some in the fridge when he comes for a visit. Let guests know where snacks are, and encourage them to feel free to help themselves to a snack & drink whenever they get the munchies!! Well, that's about it for today! Remember, making guests feel welcome is really about thinking of their needs and having a fun time together! The decorating book "Charming Guest Rooms" says it well: "It's more about grace than space." So, give your guest and hug and say "Welcome--I'm so glad you're here!"!! 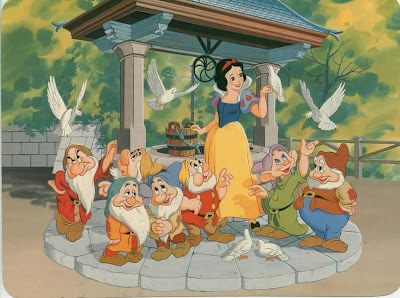 Today I'm feeling a bit like Snow White. And it's not because I'm talking to deer or holding whistling birdies on my finger! hehe I'm just feeling a bit out of my element today--not quite myself. There are little ones running around, and I'm seriously thinking of changing one (both?) of their names to "Grumpy"! I've got to sweep and dust and make the beds and clean the messes these little ones are constantly making! Here's MY messy space to clean. Do you have a "catch-all" space, too? My dining room table looks like the 7 Dwarfs kitchen did--a mess! My projects seem to accumulate there! Time to get it lookin' all pretty for large family meals! The Magic Mirror on the Wall would NOT count me as the fairest of all today, though! :) No sense getting all dolled up before cleaning! I would much rather take a looong nap only to be awakened by my Prince! Well, Hi-Ho, Hi-Ho it's off to work I go! Since there was some interest in Instant Ancestors the other day, I thought I would show you some ideas for using these cast-off treasures. In case you've missed earlier posts, an Instant Ancestor is a found photo (from thrift store, flea market, antique store, or even garage sale!) who no one seems to know about and who you decide to "adopt" and take home for your own! A lot of us have seen photos like this and wonder who would get rid of family pics? Well, the reason is that the pics were never documented with names and dates. Without these things, a person becomes just another face--there's no connection. I HIGHLY recommend that if you scrapbook you ALWAYS write names and dates of each person on each page. What if pages become separated? Or if you always scrapbook journal "Us on vacation...", or "the kids and me..." there is a great chance that future generations aren't going to know who "us", "kids" or "me" are, and your family pictoral history will also end up in the trash pile!! If you're reading this, you likely have a soft spot for family treasures. Another documenting tip is to take photos of family heirlooms (ie: Grandma's quilt, Aunt Betty's teacup, Great-Grandpa's war items, Mom's cake plate, etc.) and make a little scrapbook with each page having a photo of item, photo of person it came from, known info about item, memories, and journal specific things so that future generations will know where these things came from...stories get lost or forgotten as people age, and this sort of scrapbook could be very sentimental and useful! Above is how I currently display my little collection of Instant Ancestors. They are in a multi-clip photo holder. It's an older pic--now I have a cute little birdie up there too :). But the fern is looking a little sad now after my trip, so this pic will have to do! The fern flower pot used to be a chamber pot by the way! hehe!! Above is my fav Instant Ancestor, Charlie? Remember him?! I chose to collect "Funny Portrait" I.A.'s. My friend Kailey collects just wedding portraits. You could focus on more formal portraits, candids, just babies or children, gentlemen, family group shots, or larger school or sports group pics. Choose what speaks to you. I like the "Funny Portrait" ones best...I wanted ones that would make me smile or imagine stories about them! Above is an old tin ceiling tile, and I've used magnets made from vintage Scrabble letters to hold a photo on. A "frame" of sorts! You can pile a bunch of I.A. 's in a pretty bowl, or antique sewing drawer as I've done here. Placed on a coffee table, they could be an interesting conversation piece! Below is a closeup of the photo garland. I used some lace found in Great Grandma Tillie's Singer sewing cabinet drawers :) and some curlie-cue clips made for scrapbooking! They are made by "making memories", and could be found in scrapbooking stores. Put a cute pic in a flower frog! Always good for holding pics. Place in floral frog and then on a vintage plate. Put a glass cloche on top and voila! Place I.A. pics under glass, such as on this side table. You know the cheap round ones?! They are protected this way, but displayed in a fun & unique way! Here's Grandma with her purse and gloves. You can create little "memory" or "imagined memory" vignettes! Have a fun day, my dear bloggy friends, and next time you see an old photo you can rescue it and have your own "Instant Ancestor"! I long to worship Thee." May the peace and love of the Lord Jesus Christ be with you this Sunday! 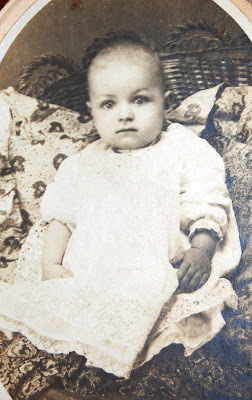 Meet Violet for today's Instant Ancestor Saturday! She comes from a well-to-do family and tolerates lessons on being a "proper" lady from her mother. Violet would much rather be daydreaming out the window and sketching with her drawing pencils! She has such a dreamy look about her, doesn't she?! Here's hoping everyone has a "dreamy" Saturday, too! :) Leave me a little comment and let me know you stopped by for a visit--I just love to hear from you!! Hi, everyone! I'm writing from my parent's place in Indiana--where I grew up! The pic above is taken at the edge of my parent's property, the farmland beyond isn't ours, but the view has always been one of my favorites. There is a little clearing through the trees, and as a girl I would sit in my bedroom and look out the window and daydream about that clearing and the adventures I would have in there! Below are some great finds from going to the local thrift store today! I spent all of $21, and got the mirror, glass & silver charger for a pitcher of lemonade or something ( I have matching drink coasters at home ), and -- more glass snack/luncheon sets from the 50's-60's!!! I have posted before about my collection of these, and I hadn't seen this flower pattern before. They were priced at $2.99, and were on sale for only--get this--75 cents each!!! I couldn't believe how inexpensive these were, and went ahead and got the whole set of 20 plates & cups!! I figured whatever I decided I didn't want, I'd sell for a nice little profit! Here's a close up of the plate & cup. It looks like 2 flowers stuck together! Isn't it cute?! Have a good one, and I'll visit with you again soon! I thought I would join the Nester from http://nestingplacenc.blogspot.com/ who is doing a show-n-tell today of people's window mistreatments! Easy solutions for windows, not needing sewing or measurements, etc. I used 1 curtain panel per window in my girls' bedroom to make these mistreatments. Aren't they cute? And so easy! All I did was put the curtain panel on a rod from Target, gather the material up in folds, and safety pin the folds together in the back to make what looks like a gathered shade! We tend to move often, and I didn't want to cut the fabric, so this seemed like an easy solution! I have matching fabric and plan to make pillow shams and dust ruffles to match. Their room has a bit of a shabby chic feel. I'll take more pics after I finish & paint super pale pink! Hope you enjoyed this, and check out the Nester's other friends who joined in the show & tell! I am more than a little like the character Sally in "When Harry Met Sally...". I have food "things". I think I'm the only person out there who found nothing out of the ordinary with Sally's pie requests. A girl wants what she wants! I've gotten over food touching, unless it has a sauce or runny substance that could "contaminate" the other food nearby. Such as: syrup from pancakes running onto my scrambled eggs, or steak juice tainting mashed potatoes. Eww. Also, I hate the taste of anything coming close to soggy. I shovel in cereal with milk faster than an Army recruit, and I can't watch people dipping cookies in milk--gag. And I must say that I highly prefer eating with a fork than using a spoon. Only applesauce with a fork, please. Or, ice cream by itself with a spoon, but if you add cake or pie, then only a fork! I went to an all girls high school. I met my husband at our college coffee house (this was the early 90's people, and alterna-grunge was it) when his band played. My friend was dating his roommate, and introduced us. The friend and roommate broke up the next day. But my future hubby sent a vax/e-mail (again dating myself because this was before everyone was using the internet!) saying thanks for coming to watch them play. I asked if he was the one with the green hair. He said, "Yes" :) and a friendship then courship ensued. Ahh, romance! I firmly believe that common sense isn't as common as it should be! I love to garden. Hated it as a kid. Gardening isn't much fun when all you're allowed to do is pull thousands of maple tree volunteers and weed. I only got into gardening when hubby and I re-hardscaped and re-landscaped at our first house. I liked the design aspect, and doing all of the work ourselves was really satisfying. From there I got into flowers, learning a LOT from plant/seed catalogs. Now I LOVE to garden, and have turned a backyard of only dirt into one that looks pretty! I am scared. to. death. of worms! Snakes can be draped on me, no problem. Just. not. worms! Before I was a mom, I worked for optometrists in 3 different states. I was a technician/clinic manager depending on the office. I really enjoyed doing that! I have Celiac Disease. An auto-immune disease where your body attacks the small intestine when you eat gluten (a protein found in wheat, barley, rye, & oats). I eat gluten-free, and I believe we all have to be a firm advocate for our own health. I once played Shelby in my high-school production of "Steel Magnolias"! I have a thing for magazines! My hubby says if it has the words: Country, Living, Home, or Southern somewhere in the title I'm probably a subscriber! Hehehe!! Well, there ya go! 10 things you might not ever have cared to know but just got put into your brain anyhoo!! LOL I'm planning to take my computer with me on my trip, and I'll do my best to get some posts out there for you. Pray we are all safe and healthy--we really need it!--and have a Fabulous Friday!!!!!! Today I'm going to continue the Creating a Welcoming Home series I've done for several Thursdays. I've been giving easy and inexpensive tips for a Welcoming Home, using ideas from a talk I've given to women's groups at my church on this very topic. There is so much that can be said about HOME and CREATING A WELCOMING HOME, and I may do longer thought-ramblings on that another Thursday or 2, but please understand that this series is just tips--not the whole she-bang on the topic! Not only do candles cast a flattering light, they often have a wonderful fragrance that can fill your home. Spread around a room, they can really add a special sparkle in a matter of seconds. One of my favorite ways to add scent to my home is to use lamp rings and oils. Just turn on the lamp and the warmth of the bulb releases the fragrance. Flowers! Not only are they colorful and beautiful, but they smell great! If you're lucky enough to have an ALDI near you they sell 1/2 dozen roses or bunch of flowers for only $2.99. (A flower garden can yield blooms all season long, for only the cost of the seeds!) Lots of places are inexpensive and I use part of our grocery budget every week or 2 to get 1 bunch, which I can split into vases to spread throughout the house. For such a small investment, I have gained several rooms of my home smelling wonderful & looking beautiful, PLUS I get such a lift when I praise God for His creativity! Cooking/Baking is a labor of love that can fill your home with delicious scents on a daily basis! What better way to bring others together than around the table?! To elicit delicious scents from the kitchen, simmer a little cinnamon in some water, find a super-simple crock-pot recipe (it smells great all day, you really can't mess these dishes up, and it can become your new specialty! ), or make the house smell great by popping just a couple break-n-bake cookies on a cookie sheet and bake. When I was single, I used to bake 3 cookies in my toaster oven, make my apartment smell cozy & yummy, have no prep work & very little clean up, AND get a delicious snack! This also worked to our advantage when selling our last house! Sound can either lift your spirits up OR drag you down. Think about listening to the sounds of: children giggling, Christian/positive songs on the radio, or a wind chime softly making music, VERSUS listening to: family members yelling at each other, a TV show where the characters keep swearing or taking God's name in vain, and doors that slam open and shut constantly. The sounds that are heard in your house can have a great effect on whether people feel welcome and at home there, or whether they would like to spend as little time in your home as possible! One of the best ways I've seen uplifting sounds brought into the house is by using Christian music. My mother-in-law has a small under the cabinet radio in her kitchen that is always tuned in to a Christian station. For much of the day, you can hear Christian praises playing very softly in the background. That sound is gently carried to the family room and living room as well. It is ever-so-soft, but what a difference in my spirit when it is on! I grew up in the country, so soft "outside" sounds (such as a singing bird on a summer morning, or the gentle sound of a windchime) really bring a smile to my face & make me feel right at home. I love hearing windchimes so much that I now have a couple of them hanging in various spots near the house so I can listen to their sweet chimes even when I'm inside! this week!! Margo has LOTS of fun projects categorized on her site--go check it out! Well, better late than never, right? Sorry this wasn't ready for you this morning, but my family & my health (another post for another time) takes precedence! :) Well, faithful readers, here's the promised T2T (trash to treasure) project!!! It started as a chance meeting by the curb. Just my hubby & the old window frame with all the glass still intact! He was a trouper, and brought it home for me. And the poor window proceeded to sit with my other projects-to-do in the garage for, oh, just 3-ish years!! Yay! Inspiration struck last week. I finally got that old window out, cleaned 'er up real good, and painted 2 coats of white paint on it in the driveway. Then the window sat some more. Just a few days this time! I printed some words off the computer to reverse paint-pen on the glass, had a few candids of the fam printed in black & white 5x7's, and went to town! And here's the finished (almost!) project!!! The words say "our family est. 1997", and has pics of my hubs and me on our 10th anniversary trip, and our 2 little girls. I still might antique it a little, and obviously have to cover up the picture hangers at the top with something cool, but it's mainly done. I love family photos mainly because I love my family so much! A lot of decorators say not to put family pics in the main rooms of your home, but I say I'd like to see these lovely, smiling faces I adore in the rooms in which I actually spend time in! And a family room should be just that--for family. This pic above is a closer look at the painted words, it's also a truer version of the color difference between frame and wall color. Below are a couple pics of the darling gifts that my new blogging friend Cheryl sent me for playing her "Paying It Forward" game! Thank You, Cheryl--I love it!!! I really had fun doing the window t2t project! I know window picture frames have been done before, but I thought you might get a kick out of this anyway! :) I love how it turned out!! Have any of you done any window projects you'd want to share? If so, put a link in the comments for this post. I went to one of my favorite shops, Piggyback Market in Apex, NC, and they were having a 30-50% off EVERYTHING sale!!! Whoo-hoo! Everything was super affordable, and will be going in my sunroom/gardenroom. We plan on putting shelves above the windows in there, and decorating with greenery and garden-y type items. This cherub is my favorite find and it was only $10 because of it's missing wing! I have been looking for one exactly like this for about 2 years, and you can't even tell it's broken when it's facing forward! Below are pictures from a magazine I just discovered called life:beautiful. It really is a lovely magazine, and I can't believe I'd never heard of it before! It is like a Christian Martha Stewart Living, without everything being so utterly complicated! :) There are gorgeous photographs, simple crafts and decorating ideas, easy recipes and entertaining ideas, gardening, well-written articles on parenting, health & fitness, marriage, finance, interviews, etc. I hope you enjoyed my finds, I'll be back to visit with you tomorrow and I'll have a Trash 2 Treasure project I've completed to share with you (this is my motivation to finish it! hehe!)!!! I hope you all have a great Saturday full of time spent with family & friends, hitting the sales, and having fun! Rhoda over at the lovely blog Southern Hospitality has invited us to take part in a What's your Favorite Yard Sale/Estate Sale/Thrift Store Find EVER party link-up! Check out her blog and see the others who joined in the fun! My personal favorite finds are these little vintage luncheon/snack plates, I think from the 1950's. I found a couple sets at yard sales one summer several years ago, and they only cost me a few dollars for the whole set! I've since found more at antiques stores and other sales, and currently have 32 plates and cups! They work great for milk & cookies! I've used them for LOTS of parties and get-togethers, they are perfect to hold on your lap. I used them for my sister's baby shower last year. Below I used the plates only (under the fan) for the goodies at my daughter's birthday tea party! And we used them for Christmas Day brunch for my side of the family, using the punch/tea cups as fruit cups! Family Room Window Treatment - Help!